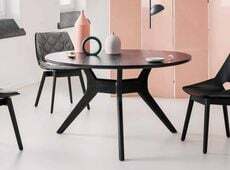 The Plinto table is a project of the designer Andrea Parisio, produced by Meridiani, a leader company in the made in Italy furniture manufacture. The Plinto table is a modern and elegant accessory, characterized by a sophisticated play of shapes and materials. The Plinth collection includes a wide variety of finishes, sizes and shapes: the tables are available with a square, round, rectangular or octagonal top. The light metal bases in contrast with important volumes, create a fascinating effect that makes the Plinth table the undisputed protagonist of the environment in which it lives.